Stratum’s unique team of Civil Engineering Design Consultants includes world-renowned road design and structural pavement engineers who can deliver exceptional, long-lasting paved and unpaved roads, either temporary or permanent, with dramatically increased load-bearing capacity and an extended design life far exceeding that of conventional civil engineering road design. 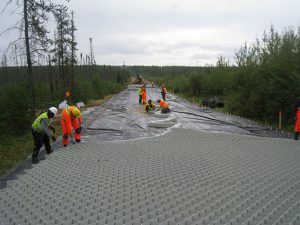 They apply their advanced knowledge of geotechnical engineering to improving roadway design, incorporating the breakthrough engineering advantages of high-strength NPA (Novel Polymeric Alloy) geocells. Roadway design begins with the calculation of a road’s expected load exposure over a period of time, known as its ‘design life’, measured in Equivalent Single Axle Loads (ESALs). The greater projected traffic load in ESALs for a proposed or existing roadway, and the longer the desired lifespan, means more and thicker layers of material will be needed in order to meet the design requirement. These principles apply to both paved and unpaved road design. Roadway design using geocell technology will achieve an equivalent or greater design life with less material and less overhead than conventional road construction methods. Why? By far the largest costs associated with roadway design and construction are the amount of asphalt required, and the production and import of aggregate fill needed to create its base and sub-base layers. 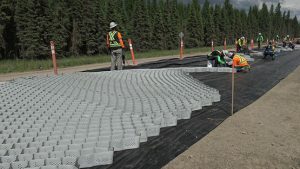 The ability to utilize resident and readily available granular infill in when using geocells as part of the roadway design becomes an attractive cost-reduction measure, reducing or eliminating the need for costly imported materials like gravel and sand. This improved sub base significantly reduces the asphalt layer thickness required. Installation of NPA Geocells is also fast and efficient. Currently, road construction is considered to be a significant contributor of carbon dioxide (CO2) emissions in Canada. A civil engineering road design project that employs geocell technology will result in lower total CO2 emissions during the construction process, as quick installation means reduced equipment run time and therefore less fuel consumed, adding an advantageous environmental benefit to using geocells in roadway design. Geocell products made with a novel polymeric alloy material are proven to be the most reliable choice for the manufacture of geocells. The superior properties of NPA nano-fibers combine flexibility with high-tensile strength. NPA geocells are also highly temperature-resistant, exhibiting virtually no expansion or plastic deformity at high heat levels and remaining ductile at temperatures as low as -70 degrees Celsius, making it ideal for roadway design applications in cold climates.